If I make the private Subnets public and set the Security Groups and NACLs accordingly, I can access the postgresql database with PGAdmin and I can run the application from my desktop using the RDS instance endpoint as the host. So the database is in good order and can be reached. When I deploy my application to Tomcat and attempt to access the database it fails: org.postgresql.util.PSQLException: Connection refused. Check that the hostname and port are correct and that the postmaster is accepting TCP/IP connecions. When I ping the RDS endpoint (DNS name) it resolves correctly to the private IP address but cannot reach the node (ALL Traffic is enabled in the NACLs and Security Groups). So I can get to both EC2 and RDS instances from my desktop from the public internet, but I cannot enable them to connect to each other from within the VPC. I set all of the NACLs and Security groups to maximum permissiveness just to force a successful connection. But even that is not working. I will include the pertinent details a little later. If anyone has any suggestions on what to check for would be greatly appreciated!!! I finally figured it out. I'll finish describing the problem and then I will provide the answer. The problem was rooted in the NALCS and Security Groups so I'll share just those details. The routes and internet gateway were straight forward. f you know any thing about this (maybe you are a network engineer) you probably see right away what the problem is. The corrected confiuration is below. The change that really corrected the connectivity between the Public and Private subnets was enabling response traffic on the Ephemeral ports for both In Bound Public subnet NACL and Out Bound Private subnet NACL rules. I also cleaned up some redundant and insecure Out Bound rules in the NACLS and Security Groups. This is a working configuration. Hopefully this helps someone. If you see anyhting that can be improved let me know and let me know if you have questions. Not the answer you're looking for? Browse other questions tagged amazon-ec2 amazon-web-services amazon-vpc amazon-rds or ask your own question. 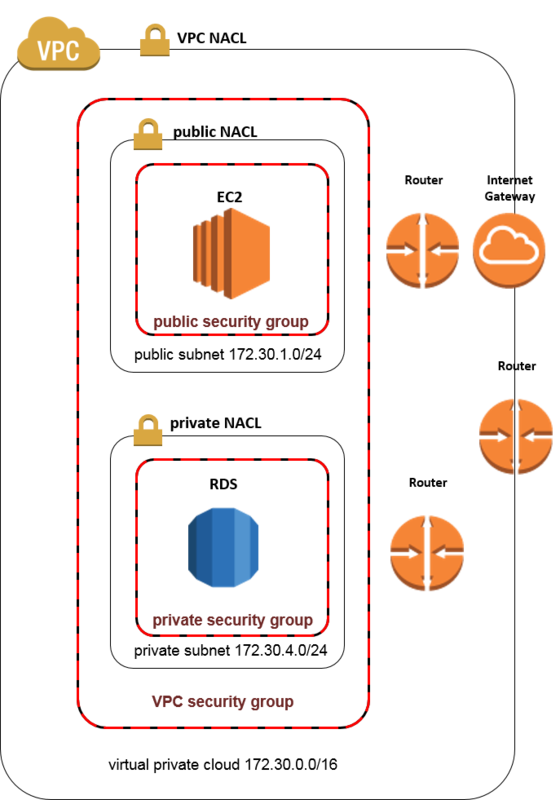 AWS VPC - why have a private subnet at all? Does RDS in private subnet inside AWS VPC need a NAT instance/gateway?